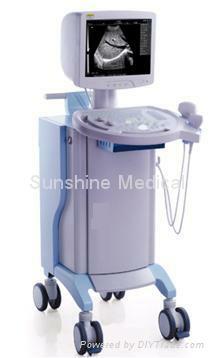 Abdomen, Gynecologic and Obstetric, small parts, etc. Optional probe：6.5MHz intra-vaginal frequency conversion probe. Optional probe：7.5MHz frequency conversion probe. Optional probe：5.0MHz micro-convex frequency conversion probe. Image processing：pre-process (continuous dynamic focus, dynamic aperture, dynamic filter）, post-process（4 grades gamma correction）、frame correlation, black/white reversal, left/right reversal, up/down reversal, edge enhancement, etc. Normal measurement: distance, circumference, area(trochoid or ellipse), volume, angle, Stenosis（length, area）, etc. Obstetric measurement and analysis: BPD, CRL, GS, FL, HL, TAD,TBD, APBD, HC, AC, GA,EFW, FT, LV THD, TCD, OFD, AFI, LMP, fetus growth curve( single frame, Four frames), OB report. Gyn. measurement and analysis: uterus volume, endometrium thickness, ovary volume, superior ovarian follicle, uterine neck long dia, GYN report, etc. Note：name, age, gender, hospital name, time, date, probe type, frequency, focus, frame correlation, gain, dynamic scope, etc.